In just a few hours, general registration will open for the 2015 Run Disney Princess Half Marathon and Glass Slipper Challenge. If you’ve always wanted to do this run, don’t wait to sign up. This year’s (2014) Glass Slipper Challenge sold in just a few hours! Sign up for an account on Active.com and if signing up multiple runners for the races, have all their information ready to go and have your credit card handy. During the Princess Half Marathon weekend, a Castaway Cay challenge has been added. In order to complete the Glass Slipper Challenge, one must register for the Challenge itself. If the Glass Slipper Challenge sells out, registering separately for the Enchanted 10K and the Princess Half and finishing both races does not count as the Glass Slipper Challenge and you will not receive the special Glass Slipper Challenge medal. Please keep that in mind when registering! 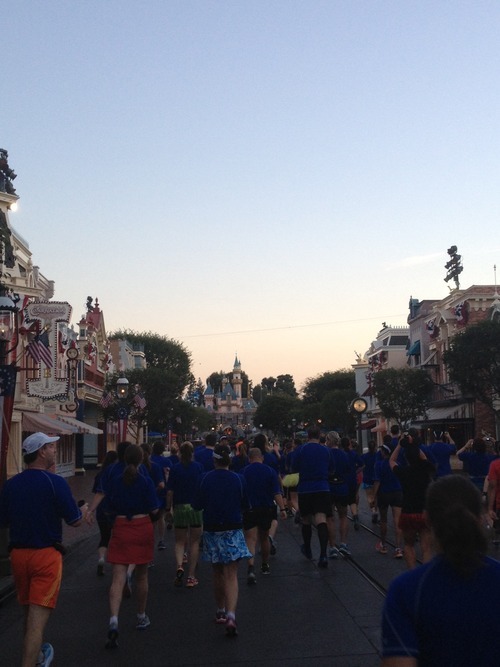 All Walt Disney World hotels are host hotels for the Princess Half Marathon Weekend. This means that transportation to and from Epcot is available and will transport runners to the start line. Be patient! If you can’t get in immediately at noon on July 15, 2014, keep trying. It is an amazing fun-filled, magical weekend. It was my first half marathon and will forever hold a special place in my heart. It was an empowering experience. It’s a great race for beginners, too! QOTD: Will you be registering for the Princess Half Marathon race weekend? It’s officially fall marathon training season, and I’m currently halfway through my summer vacation, enjoying spending time doing the things that I love – traveling, reading, running but also lounging. Spent a long weekend with my mom and friends in New York/North Jersey and now I’m back home going over marathon training plans. I used Hal Higdon’s marathon training plan last summer for the Philadelphia Marathon and decided to use it again, but this time I’m using the Novice 1. It has you running four days per week, with one long run at the end of the week. Of course with my hectic schedule, it’ll need some tweaking. I really would love to work with a running coach but they can get really expensive. Not running since early May made it difficult to get my running shoes on and get out of the door, but it got done. Hal Higdon’s plan is 18 weeks long and since there are 20 weeks left until the Philadelphia Marathon, I’m taking two weeks before the program begins to warm up and ease back into running. The temperature last night was in the high 90’s and went out for a 3.11-mile jog. I slowed down and walked as needed. Running during the summer months teaches us about endurance. Once the cooler months arrive, it feels like you’re flying. Do you have a tried-and-true marathon training plan? Have you used a running coach? This is pretty much the story of my life these days. Between my mother getting upset with me running half-marathons and marathons, (angrily, she says, “Just stick to the 13.1 ones!”) and friends and family not quite understanding why any human being would put themselves through such torture and punishment for a “stupid medal”. Or, “I can’t even run half a block, and you’re running, what? 26 point, what?” Whatever your goals in life are, don’t let anyone steal away your desire to complete them, for no goal is too big or impossible to aim for. If it makes you happy, and God knows I love the way running makes me feel, then do it. Don’t run with just your legs, run with your heart. Hi there guys, this past week has been nothing short of amazing! 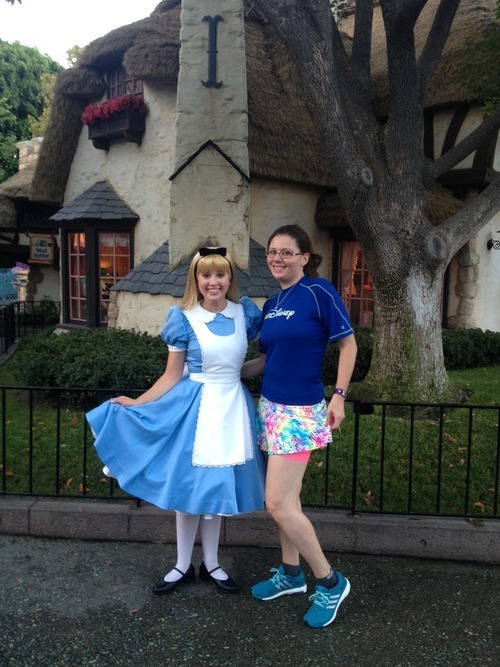 After doing much stalking on the Disney Parks Blog and on Twitter, I was selected to be a part of the Disneyland Half Marathon Meet Up. It is a chance to meet up with the people behind the scenes who make this magic happen – Faron Kelley, Director of Marketing at runDisney; former Olympic runner Jeff Galloway; actor Sean Astin; Joey Fatone from ‘N Sync; first female winner of The Biggest Loser, Ali Vincent; Diet Diva Tara Gidus, and last year’s winner (and owner of the fabulous Running Skirts), Cindy Lynch. So, now on to the fun stuff! We were scheduled to meet in front of Mickey’s Sorcerer Hat in front of the Disneyland Hotel no later than 5:30 AM. Upon arrival, we were given a waiver to sign and were handed a runDisney tote bag containing lots of goodies: a runDisney blue tech tee, a one-day Disneyland Park hopper, full-sized H2O products, pins from ABC’s new hit show Once Upon a Time in Wonderland, and so much more. 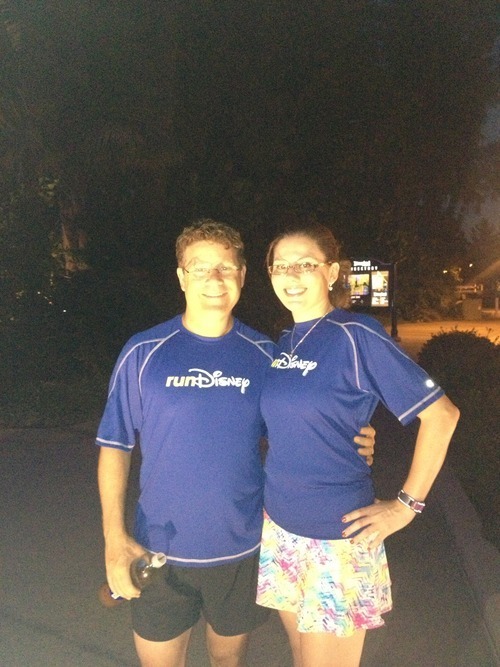 I was fortunate that two of my friends from my online running group were chosen as well and we planned to dress alike. We approached Sean Astin and took some photos with him. Let me tell you that I was not one bit nervous talking to him! He is so down-to-Earth. He asked where I was from and said, “Philadelphia”. Sean was in Philadelphia in the late 90’s filming Kimberly and mentioned how much he loves the city, rich in history and definitely one of his favorite cities. He also gave me advice on motivation and preparing to run my first marathon. 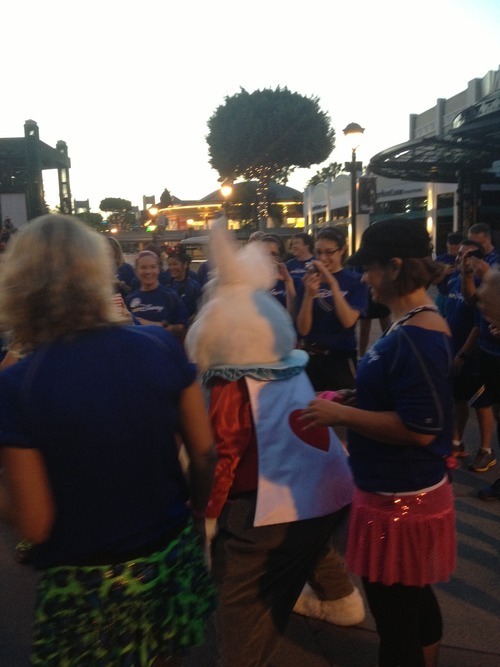 We then walked over to Downtown Disney and met in front of ESPN Zone, where White Rabbit showed up late (as usual!) That’s Miss Ali Vincent on the right in the pink sparkle athletic skirt! After that, we were on our way! We separated into two groups: a run/walk group led by Jeff Galloway, and a running group (Sean Astin, Tara Gidus and Cindy Lynch ran in that group). I chose to run/walk with Jeff Galloway, Ali Vincent and Joey Fatone. Running through Main Street, Disneyland. 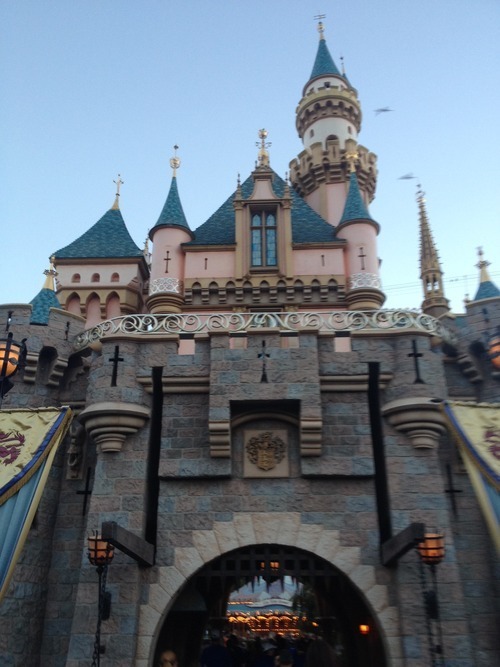 Sleeping Beauty’s Castle up close! We paused here for about 20-25 minutes, which allowed some of us for brief chatting/taking pics with Joey Fatone. He was so nice!! 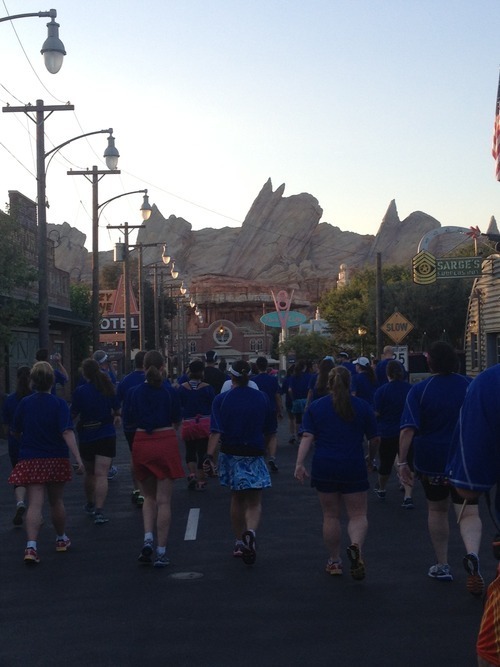 Once again, we were on our way, this time through Disney California Adventure Park and into Cars Land. Disney did a fabulous job creating Cars Land, my favorite part of DCA. We’ve reached the end of our run! 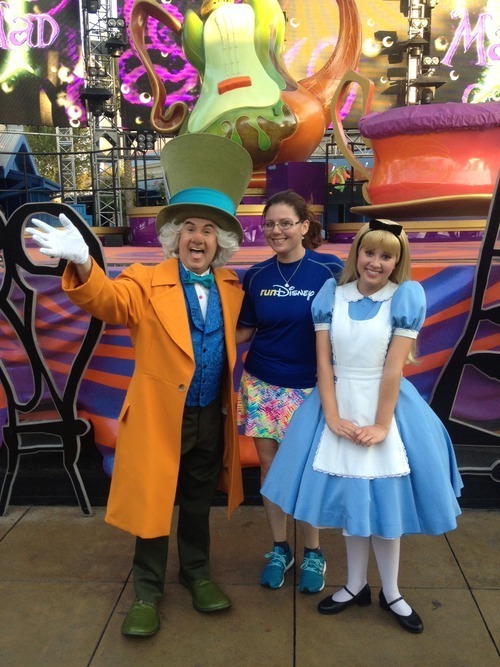 We were greeted by the Mad Hatter. 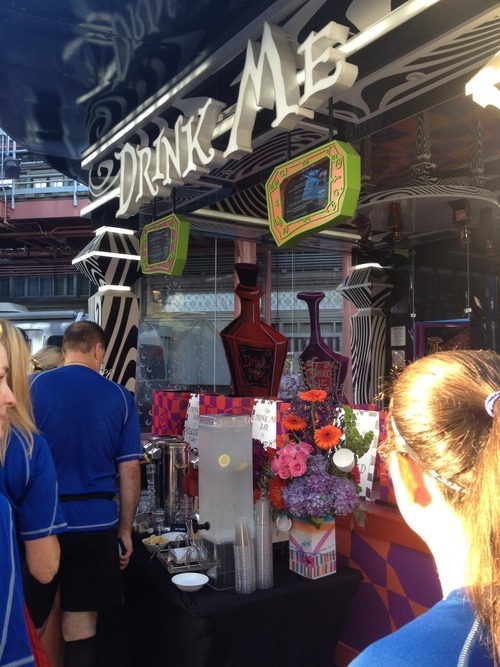 Food and drinks were at the finish line for us in the very “Drink Me” bar. We sat down and waited for many surprises that would soon follow. Today I started training my Mom for her first 5K. She is very passionate about autism and wants to run for autism speaks. 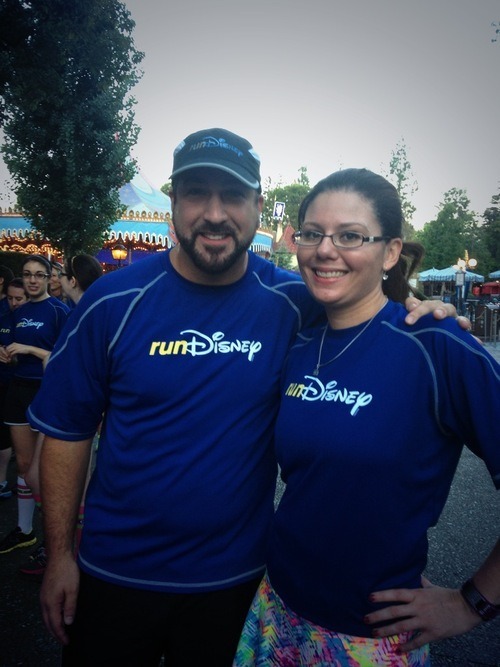 For her, I downloaded the 5K app from Jeff Galloway, former Olympian and runDisney trainer. His method works by taking walk breaks as needed, ensuring that you’ll finish strong. I got her on the road, wearing my half marathon tech shirt and all, Pandora on the iPhone, Nike Run app on and ready to go. She followed the program warming up with a walk for 3 minutes, then alternating running one minute, walking one minute for a total of 20 minutes. I am training for a run next weekend so I ran and kept coming back to her, making sure she was okay. We did five miles. Woohoo!!! Came home and drank lots of water, had some polenta and Swiss chard for dinner and a kind soul dropped off some cherry water ice from Rita’s to top this lovely day off. Now for my run…I walked the first 5-10 minutes with Mom, gave her the instructions and then took off on my own. I ran my first mile at a 9:59 mm pace, at times getting as fast as a 8:45 mm for about 1/4 mile or so. Mile 2 and I started taking a bit of walk breaks for about 30 seconds or so (didn’t pack water or Nuun) to catch my breath and continued on. I passed some hills and I spoke to them, told them I wasn’t afraid of them and I ran up those hills. After about mile 4, my hips were hurting and I walked the rest of the way home. I stretched, I rolled with the massage stick, got a foot massage and now some ibuprofen. I’m starting to think it’s my running form that’s keeping me from running pain-free. Three pairs of expensive running shoes and no difference whatsoever. Time to rest; good night!